Now that winter is upon us, I feel the need to head right back to summer. Luckily, I discovered Calvin Klein Eternity Summer Eau de Parfum Spray hidden in my stash over the weekend -- and I've been spritzing myself continually ever since. The words that come to mind when describing this fragrance: Crisp. Delightful. Light. Fresh. It's everything you would expect from a fragrance that's meant to evoke the feel of summer. Top notes of lychee, pear blossom and ginger combine with middle notes of fresh basil, black pepper and chamomile. Base notes of white amber, anise and Hinoki wood add a rich, unexpected depth to the scent. And the bottle? How much more summer can you get? The long, lean silhouette is punctuated with a beautiful garden of blooms in vibrant greens and purples -- so gorgeous sitting atop the vanity. 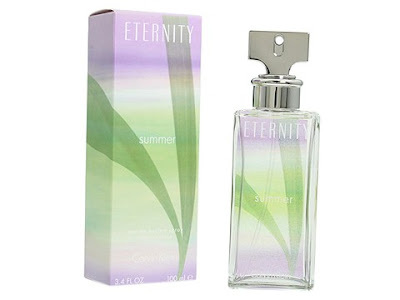 Unfortunately, Calvin Klein Eternity Summer Eau de Parfum Spray was a limited-edition scent that has since sold out. But it is available at various sites online, so I definitely recommend searching for it!